Ambassador and Permanent Representative Dr. Amrith Rohan Perera speaking during the Sixty-Third Session of the Commission on the Status of Women said that in the past four years, the government has accelerated the implementation of its programs, policies, and action plans to promote gender equality. 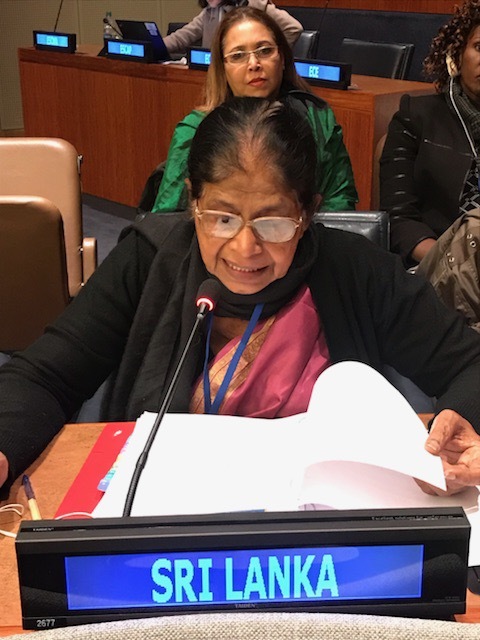 Dr. Perera delivering the country statement on 14 March 2018 at the United Nations General Assembly in New York, further said that “a National Women’s Policy was being drafted to promote gender equality and to protect women’s rights, providing an overarching framework for guiding further developmental policies and strategic interventions. 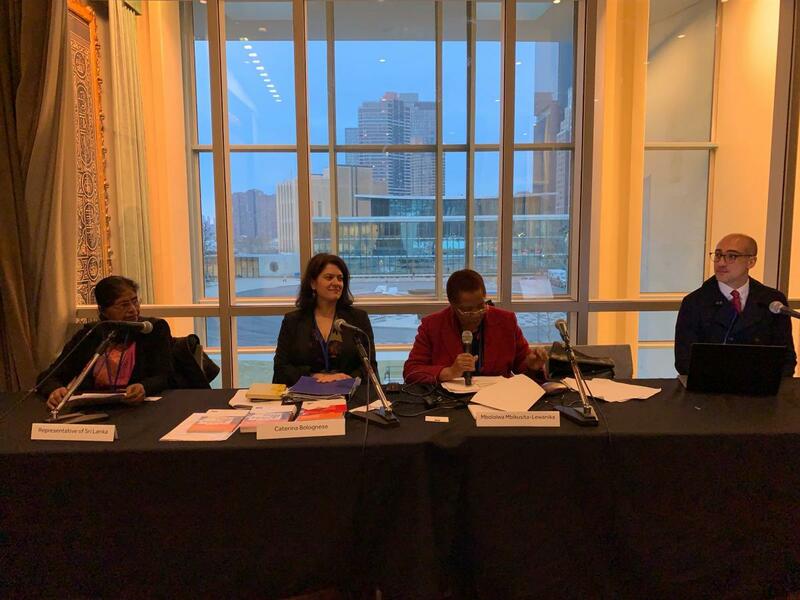 The Sixty-third Session of the Committee on the Status of Women (CSW) saw a large number of delegates representing states, UN entities and civil society from around the world meet at the UN headquarters in New York over two weeks from 11-22 March 2019. The annual deliberations concluded last Friday after days of intense dialogue, and with the adoption of the Agreed Conclusions. The outcome document adopted by Member States puts forth concrete measures to bolster the voice, agency, and leadership of women and girls as beneficiaries and users of social protection systems, public services, and sustainable infrastructure. 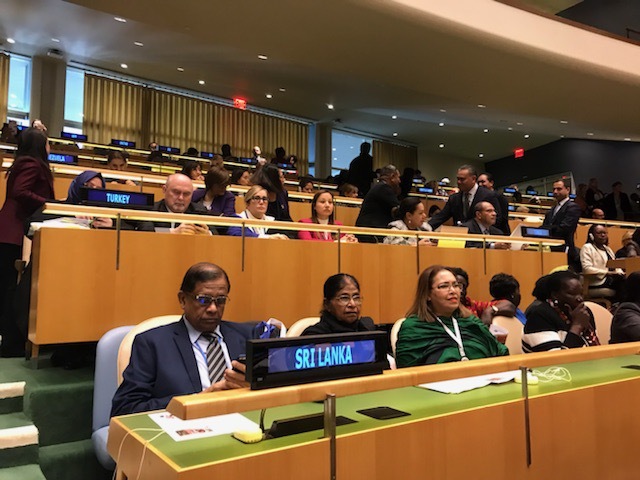 Sri Lanka’s delegation to the CSW this year was headed by Ambassador Dr. Rohan Perera and included Mrs. Swarna Sumanasekera, Chairperson, National Committee for Women in Sri Lanka (NCW) and Mrs. Sonali Samarasinghe, Minister, Permanent Mission of Sri Lanka to the UN in New York. Sri Lanka also participated in the Ministerial Round Table titled “Good Practices in the provision of social protection, public services, and sustainable infrastructure, including for recognizing and valuing unpaid care and domestic work.” Representing Hon. Chandrani Bandara, Minister of Women and Child Affairs at the Ministerial Round Table, Mrs. Swarna Sumanasekera, Chairperson, NCW noted that in Sri Lanka, the wide range of social protection programs have promoted growth with equity, and covered such areas as employment promotion and protection, social security insurance and safety nets. The Permanent Mission also organized, co-sponsored and participated in four side events focused on areas of priority for Sri Lanka. These side events were very well attended and received. In his welcome address at an event titled “How can infrastructure better contribute to the achievement of SDG 5” Ambassador Perera noted that Sri Lanka was mindful that infrastructure was not a gender neutral entity and must be approached by considering the needs of women at all stages of its planning and development. Mrs. Sumansekera speaking as a panelist focused on water supply, the energy sector and the transport system as three sectors contributing to overall development, and noted that these sectors benefit unpaid care workers and domestic workers who comprise 53% of the female population. The event was co-hosted by the Permanent Mission of Sri Lanka in collaboration with the Permanent Mission of Estonia, the United Nations Office for Project Services (UNOPS) and Swedish International Development Cooperation Agency (SIDA). In an event titled “The role of parliaments as partners in women, peace, and security: experiences from the global project,” Ms. Sumanasekara speaking on behalf of Hon. Chandrani Bandara, Minister of Women and Child Affairs, said that in December 2015, Parliament established sectoral oversight Committees and several other important committees to support the government to advance the WPS agenda in the country. The event was co-hosted by the Permanent Mission of Sri Lanka together with Norway, Canada, the United Nations Development Programme (UNDP) and the International Civil Society Action Network (ICAN). The Permanent Mission also co-hosted with Kenya and the NGO Committee for Sustainable Development-NY an event titled “Women Investing in Peace.” Panelists included the Deputy Minister for Education of Afghanistan and high-level officials from Kenya and Sri Lanka thus bringing together a group of experts to explore not only the subject of women's economic empowerment but also how women can use economic leadership to invest in sustainable peace. Welcoming the large gathering Permanent Representative Ambassador Perera highlighted that “Sri Lanka firmly believes that it is the meaningful participation of women in the international peace and security agenda that will bring about change in the world. It does not suffice that women are present at the peace table merely to satisfy a superficial gender balance component or to check a box on a management reform achievements sheet. 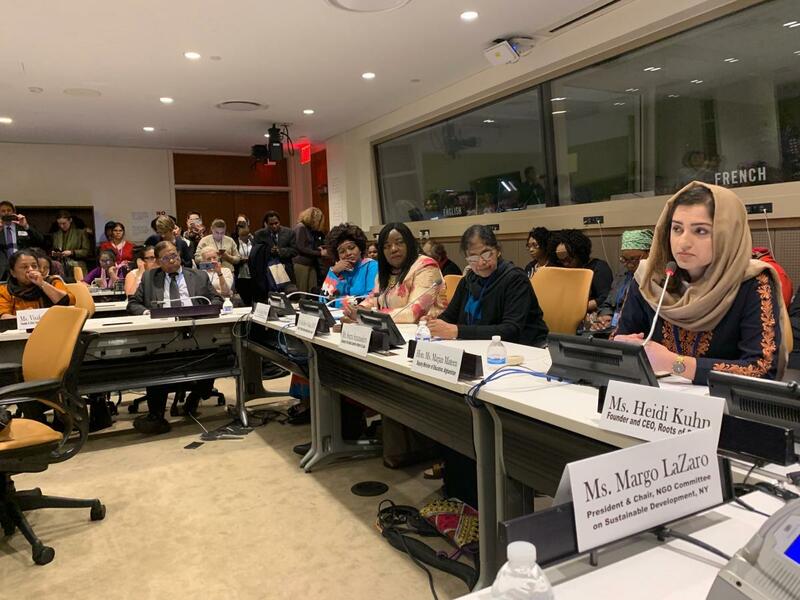 Women must be given the space to truly engage both at the peace table and beyond – and at all levels – as leaders, researchers, workers, pen holders, and change markers,” he also noted. 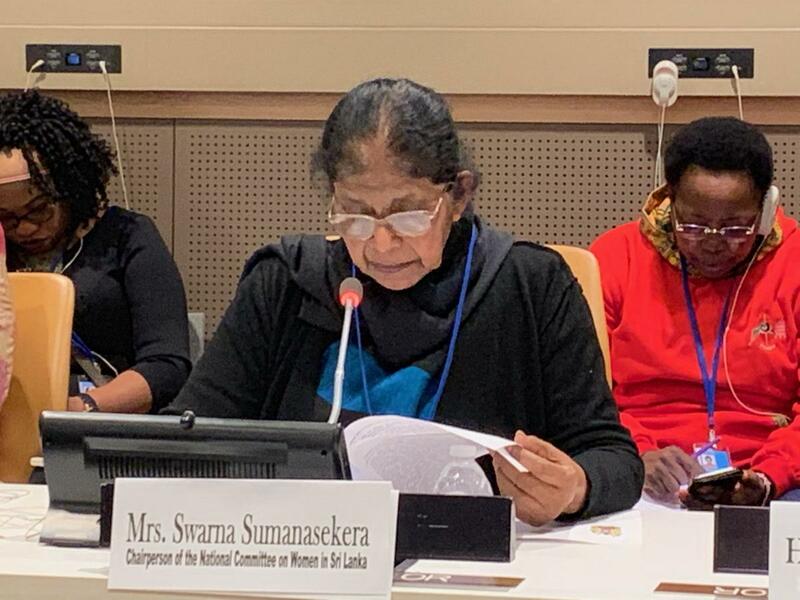 Additionally, Mrs. Swarna Sumanasekera participated at the Annual Consultation of National Women’s Machineries of Commonwealth Countries to prepare for national and regional reporting –for gender equality and women’s empowerment in the Commonwealth towards the full realization of the 2030 agenda.